Prepared in a personal capacity for us by Dr Simon Hodgkin of the Astronomical Survey Unit, Institute of Astronomy, Cambridge. 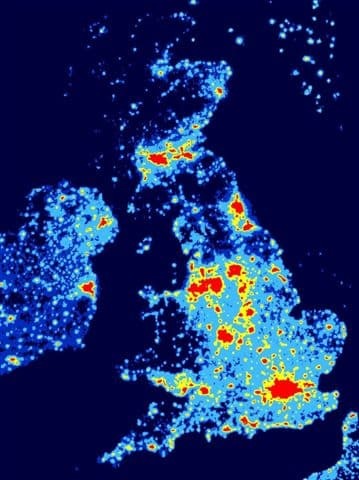 Truly dark skies are only found far away from the urban concentrations where most of us live. From a city centre location we are lucky to see even 100 stars, while under a dark sky we can easily see stars in their thousands, dominated by our own Galaxy, the Milky Way, stretching across the celestial hemisphere. Skye is one of the darkest sites in the whole of Europe, and Waternish one of the darkest places on Skye, without a single street light on the whole Peninsula. Standing outside the Stein Inn, the nearest streetlamp is in Dunvegan, some 5 and a half miles distant as the crow flies. From the northern tip of Waternish, at Waternish Point, it’s almost 12 miles. In fact the nearest streetlights that can be seen from Waternish on a clear night are in Lochmaddy which is 22.5 miles away across the Minch on the Outer Hebrides. Apart from the Moon and the stars and the Milky Way, at a truly dark site, the dominant contributor to the sky brightness is from Zodiacal light, seen as a triangle of light rising from the horizon and pointing along the Ecliptic plane. It is best observed just after evening twilight in the west, or in the morning eastern sky. Zodiacal light is just sunlight scattered by fine dust in our solar system, so it is aligned with the planets of the Solar System. Most people have never seen Zodiacal light, let alone Gegenschein (counter-glow), which is a very faint brightening from the same dust at a point directly opposite the Sun. occurred in 2006) and Solar maximum which is expected around 2011-2013. During Solar maximum we might expect to see strong aurora several times every week above latitudes of 50 degrees, statistically best observable close to the Equinoxes in March and September. In the Northern latitudes of planet Earth we see strong seasonal dependence on the duration of a night, with the shortest nights around Midsummer in June (also not the best time to observe Aurorae), and the longest nights in mid December. During mid-June, the night sky on Skye never becomes truly dark, and is permanently in twilight, with only a little over four hours passing between sunset and sunrise. Compare this to December, when the winter nights last almost 18 hours (including twilight). Staring into the dark sky on a winter’s night on Waternish, one is reminded of Olber’s Paradox, which has been attributed to Johannes Kepler in 1610. Why is the night sky dark at all? In a Universe which is infinite we would expect every line of sight to end at the surface of a star – our night sky should be bathed in light! You can imagine an analogous effect when standing in the middle of a large forest looking out – all we can see are the trees, even in a quite finite forest. The accepted mainstream answer seems to have been first proposed by Edgar Allan Poe. He pointed out that, the age of the Universe is a significant factor, and that light can only have reached us from a distance corresponding to the age of the oldest stars.